"Hearty turkey drumsticks are marinated and basted with a tangy orange marinade. This is great for leftovers, but also a fine way to enjoy turkey throughout the year!" In a blender or food processor, mix the orange segments, vinegar, and brown sugar. Transfer to a large resealable plastic bag, and mix in the reserved mandarin orange liquid and oil. Place the turkey drumsticks in the bag, seal, and marinate in the refrigerator 1 hour. Place the marinated turkey drumsticks on the baking sheet, and season with salt. Cover, and bake 30 minutes in the preheated oven. Remove cover, and continue baking 1 hour, basting often with the remaining orange mixture, to an internal temperature of 180 degrees F (80 degrees C). See how to thaw, brine, and roast a super-moist Thanksgiving turkey. 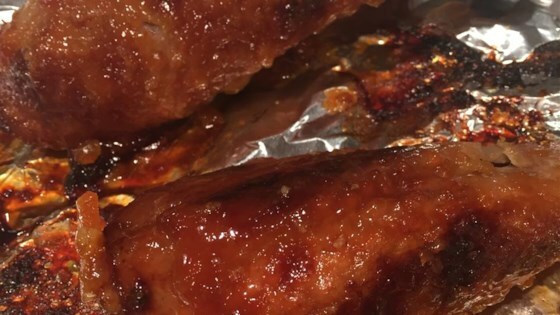 Leftover marinade may be heated and whisked with water and flour for a gravy-glaze. I substituted orange marmalade and orange juice instead of mandarin oranges to increase the orange flavor. Worked like a charm. Legs were flavorful and juicy. This was okay. I was disappointed because there was not a lot of flavor to the turkey even with marinating and basting. I would probably not make again. Sorry. We really enjoyed this recipe. I followes it exactly. When the legs were served, I made sure everyone also added the wonderful sauce to their dish for dipping! good but would have liked to taste more of the orange flavor in meat.